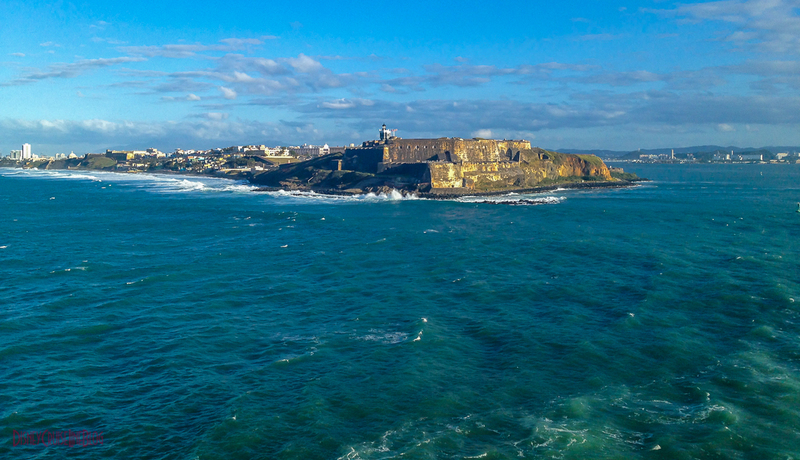 When we set sail on our 7-Night Eastern Caribbean cruise aboard the Disney Fantasy, we had absolutely zero plans for our day in San Juan, Puerto Rico. We had some idea on what we wanted to see and do, but we planned to see San Juan on our own, and go on an adventure without a set schedule. We had planned on meeting up with friends who live in San Juan, but there was a communication error, which left us armed with Google maps on our iPhones and a beautiful city to explore! Back in December, our amazing server Sergio told us all about San Juan. He said it was amazing and promised to give us all the tips he had when we returned. Sure enough, Sergio delivered as promised! We started our morning with breakfast in Cabanas on the open deck overlooking the San Juan Harbor. The cruise dock is located in an amazing location on Ave Las Nereidas, and almost directly across the street from CVS, which was our first stop around 9:30 AM. This is a great place to restock your depleted toiletries, or something you forgot to bring from home. We noticed a number of crew members stocking up. Here is a mini tip – if your looking for something ask the cast and crew for a suggestion. As a bonus, CVS has restrooms! We grabbed a few postcards to fill and mail out and then we headed out. We continued our way into historic Old San Juan stopping at some of the retail shopping establishments; Marshalls, Tommy Hilfiger, and Del Sol. Say you (allegedly) leave/drop/misplace part of your wife’s swimsuit the day before at Maegan’s Bay Beach in St Thomas….. no problem; Marshalls is your get out of jail free card. While the ladies were shopping, I stood outside and people watched. Now, I was not sure if this is normal, but there was a heavy police presence patrolling Old San Juan on foot and in cars. As we would later find out, there was a police protest scheduled around the lunch hour. Apparently, the local government was messing with their benefits. Old San Juan is pretty; the buildings are vibrantly colored. 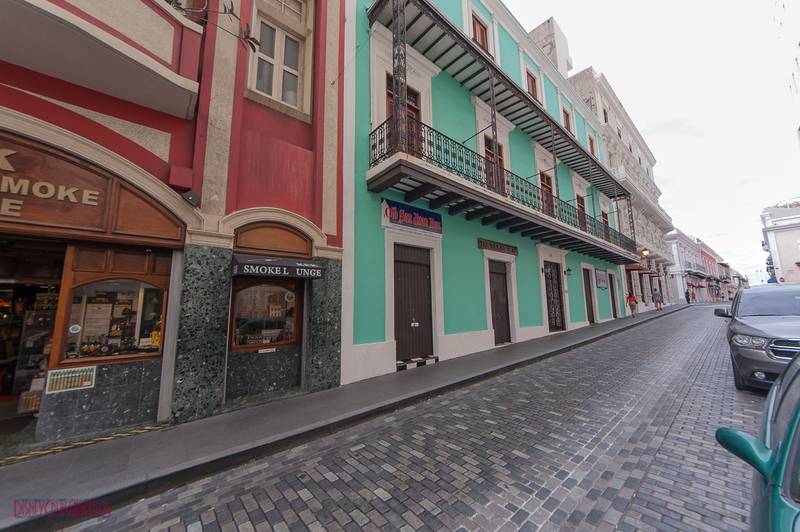 The streets in Old San Juan are paved with these really great cobalt blue cobblestone pavers which were originally brought to Puerto Rico in the early 1700’s on European merchant ships as ballasts. 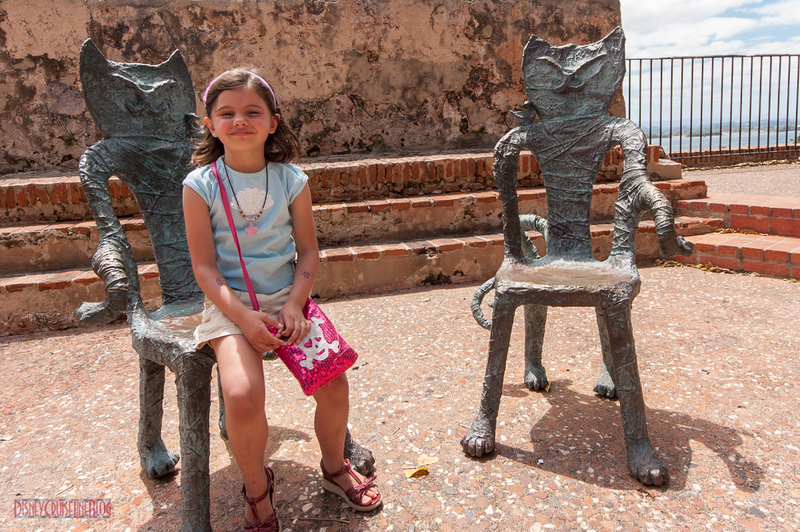 There are feral cats roaming the streets with some having a Spanish lineage. From what we were told, the origin of the cats stems back to the days of Christopher Columbus in an attempt to deal with rats. These friendly cats are looked after by an organization called Save the Gato, who operate a trap-neuter-release (TNR), and an adoption program to keep the cat population under control. We have used our local TNR program here in Tampa and think it’s a great program to support. 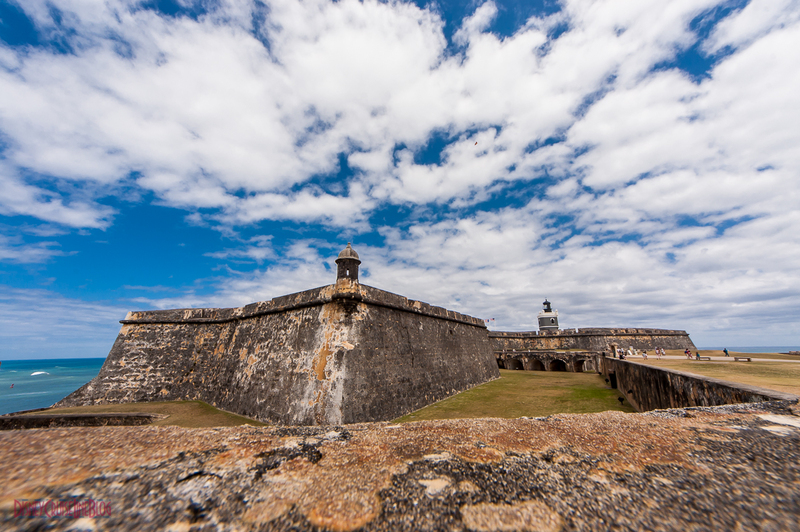 Our walking tour of Old San Juan continued as we made our way to Forte San Felipe del Morro, also referred to as El Morro. The 16th Century fortress was built by Spain on the northwestern most tip of Old San Juan to defend the San Juan Harbor. 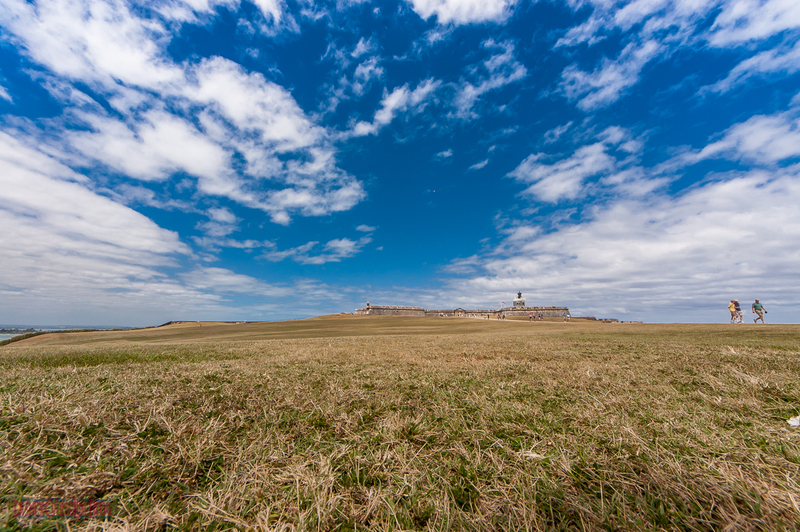 In 1966, El Morro was designated a National Historic Site. 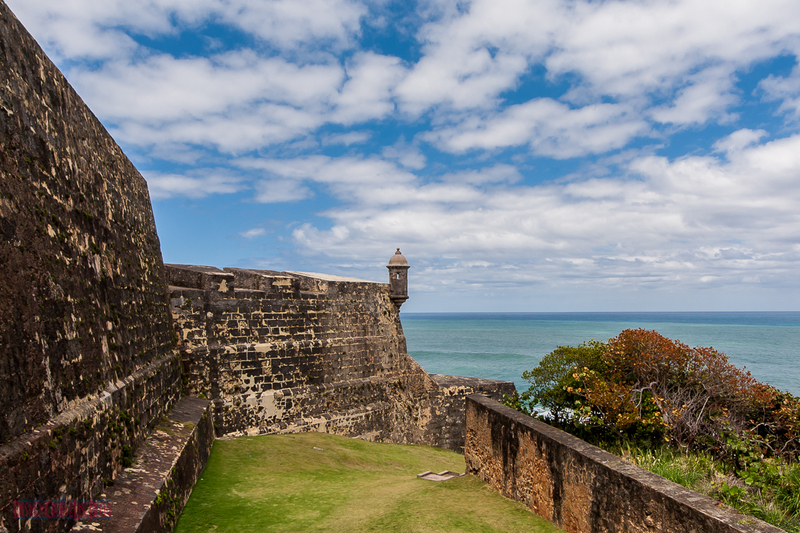 Admission into El Morro is free for ages 15 and under, and only $3 for everyone else. 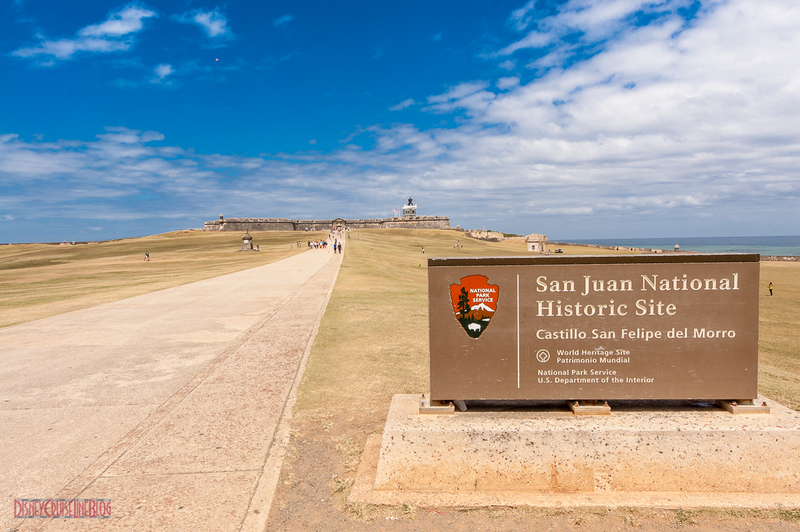 For $5, you can get admission to both El Morro & Castillo San Cristobal. 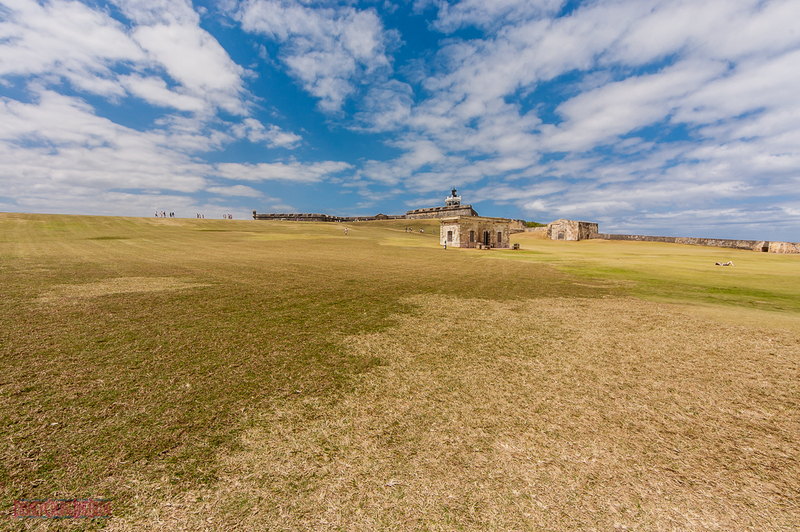 El Morro is open from 9:00 AM to 6:00 PM daily with ranger-guided offered throughout the day. Informational pamphlets are available for self-guided tours, and a movie is shown every 15 minutes. Check out the National Park Service’s website for more information and to verify the current operating hours. As you walk up to the Fort your surrounded by an open vista that seemed to be a perfect setting for flying a kite. The grounds leading up to the Fort would make for a great golf course. There is a public restroom in the field, but it will cost you a quarter to use it. There were quite a few people flying kites, including one family with a Nemo kite. Look close at the following photo and see if you can find the Nemo kite. 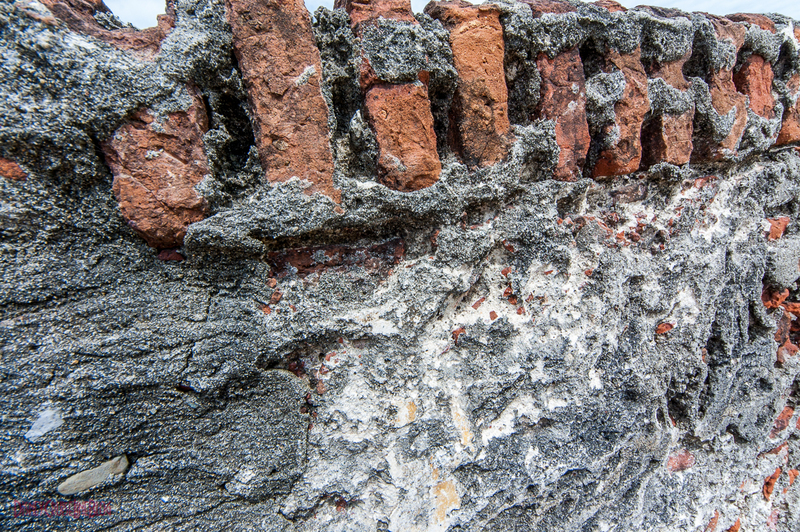 Santa María Magdalena de Pazzis Cemetery is just outside El Morro, and dates back to 1863. 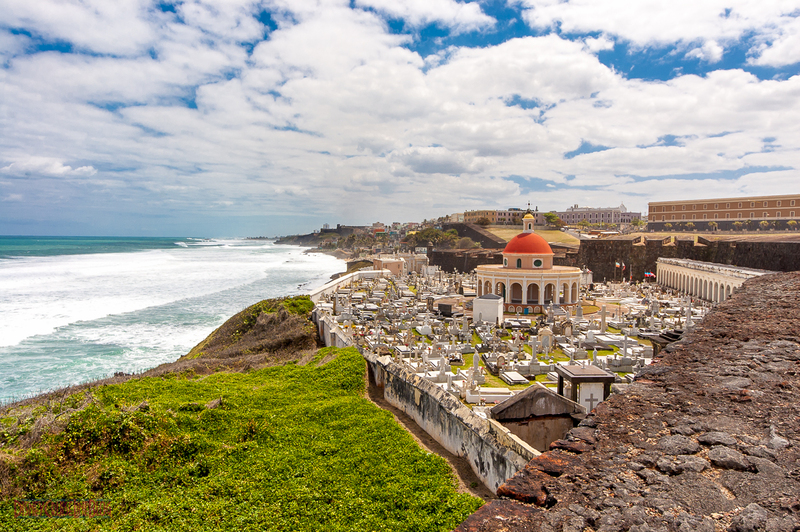 The cemetery is the final resting place for many prominent residents of Puerto Rico. 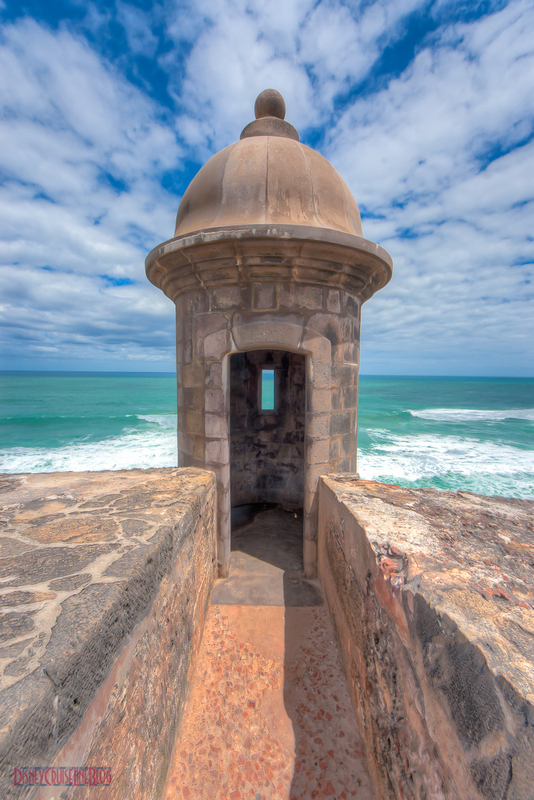 Along the wall, you will find a guard look-out as you walk from El Morro towards the cemetery. It is fascinating that this was all built by hand long ago, and is still holding up today. We definitely wanted to go inside and tour El Morro, as well as San Cristobal, but time was not on our side. It was already about 12:45 PM & we decided it was time to head back towards the port where the piers are located. We wanted to catch the 1 PM ferry to Cantaño, Puerto Rico to visit the Casa BACARDI Visitor Center. 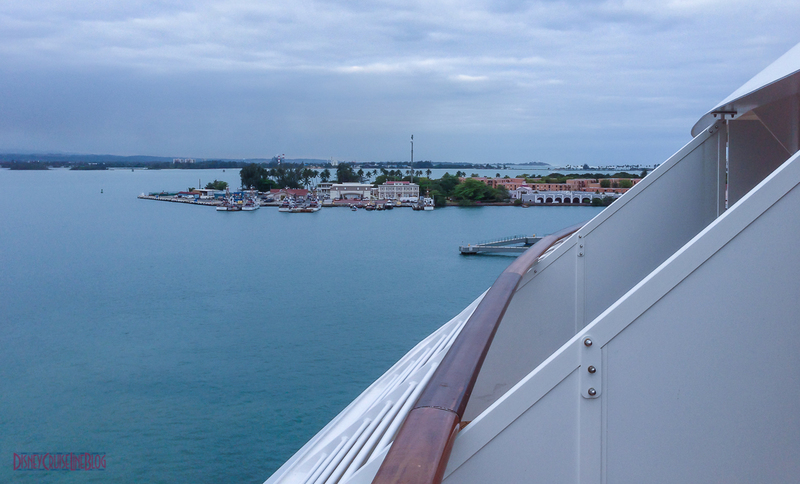 We purposely did not prebook any Port Adventures with Disney or on our own because we wanted to explore the area on our own, and get a better lay of the land for an upcoming Southern Caribbean cruise aboard the Disney Magic which sails from San Juan. We plan on arriving the day before our cruise departs and staying one night after it returns (depending on flights of course). We are glad, as we only got a taste of San Juan and are itching to go back for more!! 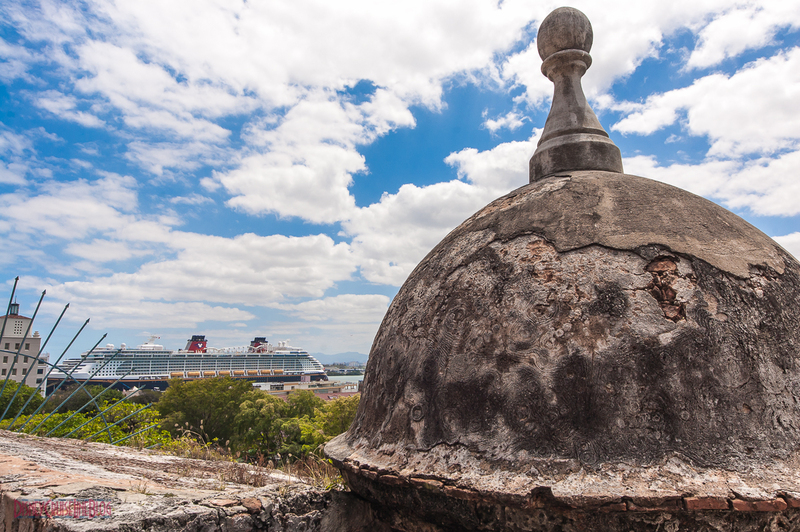 Disney Cruise Line offers a variety of Port Adventures in San Juan, but not to Fort El Morro. If you feel up to it, you can see Old San Juan and the fort on foot at your own pace. It was about a 15 minute walk from the Fantasy to the fort through Old San Juan. The great part about touring San Juan was that we had use of our iPhones, and more importantly a map with walking directions. Also, I want to mention that at no point during our morning stroll through Old San Juan did I feel we were in a shady part of town. Coming up next, our journey to Casa Bacardi for the Distillery tour. This entry was posted in Port Adventures, Trip Report and tagged Disney Fantasy, Eastern Caribbean, San Juan by Scott Sanders. Bookmark the permalink. Hi Scott.We were on the same cruise as you and also toured San Juan on our own. One thing I did beforehand was get a tour book from AAA. Under the San Juan section it listed a nice walking tour. We didn’t do all of it though. There is a free trolley and we used that to get to San Cristobal and then over to El Morro. We toured both forts. After touring El Morro we took the walking tour back to the ship. It takes you through the famous Red (San Juan) gate and then along the water. That part was really nice and well kept. Nice little shady sections along there too. I took so many beautiful pictures that day. We also talked with a police officer and found out about the protest. The trolley took us near the city hall when it was going on and then on the walking trail we were near the Governor’s residence and saw more. The police officer we spoke with said that it is a peaceful demonstration so no worries for tourist that it’s not like those demonstrations they have in the US. Hopefully someday we will go back as there was so much to see. Should have known you would have the best review of San Juan that I’ve seen! Thanks Scott! Thank you for the kind words Sharon! Hello Scott, how can I arrange to get the same table service team as I had on my last cruise? Dave, if you booked with a travel agent ask them to add this as a request on your reservation. If you booked directly with DCL, call them and ask them to note this on your reservation. Please keep in mind that this is just a request. Would this route be somewhat easy to navigate for someone with a mobility scooter? Thanks. It would be challenging, but may be possible.